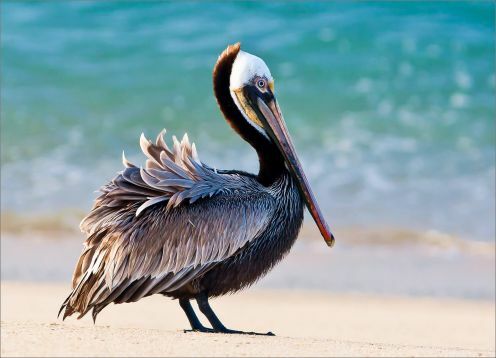 Its look and feel is very similar Wing Brown Pelican; who it is considered a close relationship well. Among the most notable differences between these two pelicans we noticed that the Peruvian Pelican is a much larger bird, presents wattles on the facial skin and the bag of adults have blue hues. Able length 1.5 meters. The wings can reach a magnitude that exceeds 2.28 meters. Habitat: Normally kept in the rocky islands near the mainland. Some individuals prefer the mainland while they are not nesting. Very common during this season on piers and harbors within its range. In times of scarcity they are more numerous on the coast; there have been cases considered rare, during critical times good many of them have moved to self Lima, Peru. Inside the city they have been forced to seek survival in landfills, having to resort to feeding on carrion. 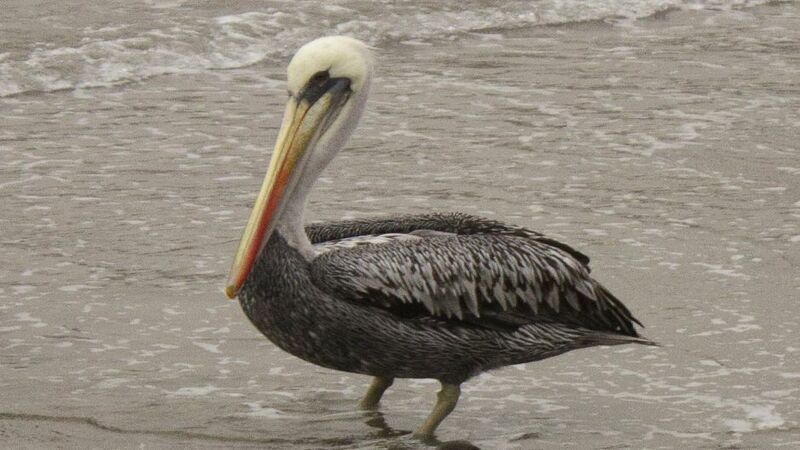 The Peruvian Pelican is a native of Humboldt currents in the Pacific coast of South America. Its distribution includes the coast and nearby islands to the mainland in almost all Peru, continuing south along the coast to the center of Chile. After nesting some moving south, extending its distribution to the islands of Chiloe, Chile. Some specimens have been considered lost, in Tierra del Fuego. In 1981 the total population was estimated at about 800 thousand pelicans. 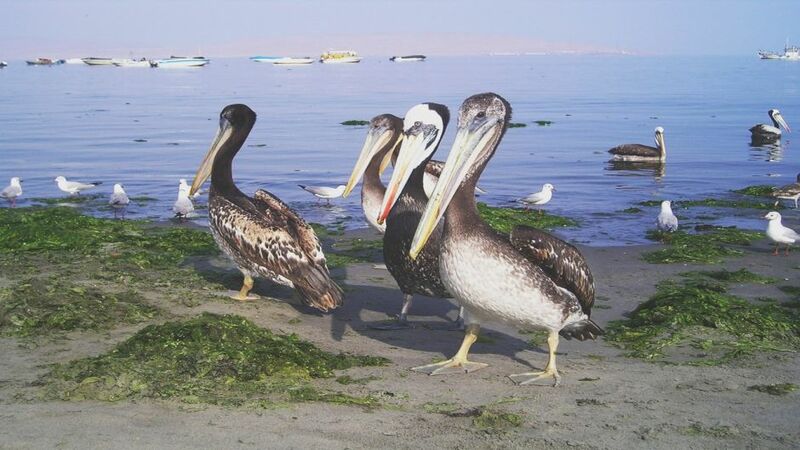 The Peruvian pelican nests in the islands not far from the continental coasts in virtually all of Peru, continuing south to central Chile. Nesting season lasts all year, being the busiest months in the spring and summer. Integrated nesting of several species of seabirds colonies. 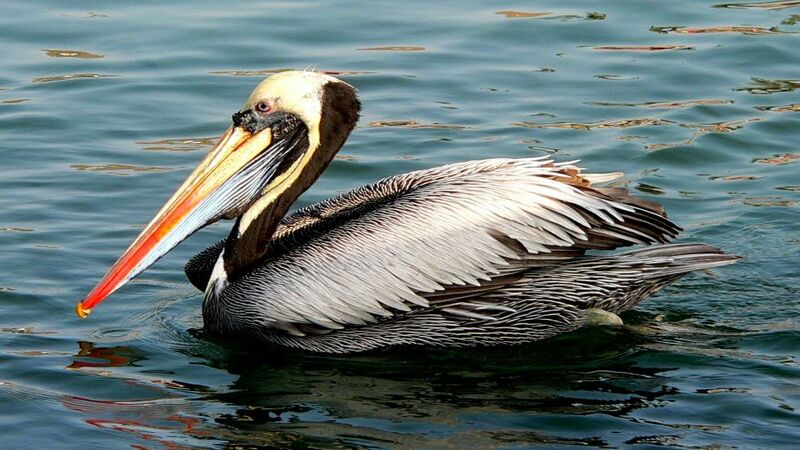 This pelican is the largest of these birds, which allows you to select the best places. The nest is a place on the floor where perhaps add some material. The usual clutch has two to three eggs. Both parents incubate and care for the young.